E-HELP FORM when you're suing pro-se self file, #DCPP #NJDYFS #DYFS #DCFemployee #DHS et.al., be sure to fill out and submit." Call within 15 to 30 minutes, after to confirm you're having an appointment to speak to e-staff/owner/founder directly. powerful unique website(s) as there is at least "1"
Call from 1st known violation. Call as many as you can. to search for a lawyer who "cared"enough to represent the family. "The Time is Always Right. . . To Do what is Right . 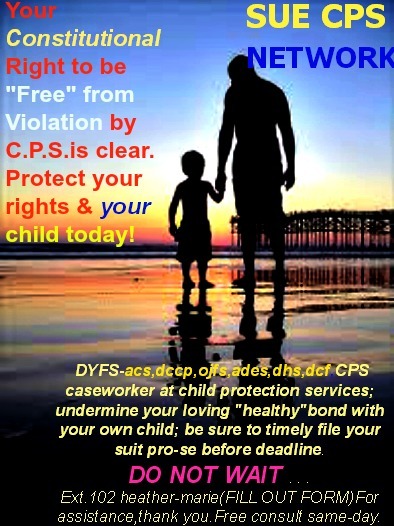 . . "
(only call when your submission below is sent to our student ctr.if you are suing on your own,known as pro-se(self file)CPS worker for violation. No call shall be connected,until HELP-FORM is filled out. The U.S.District Federal Ct; has given, the green light to let daughters & parent civil right lawsuit to move forward,that was filed pro-se,no lawyer at time of file. Inexcusable act(s)severe harm for almost eight years, almost a decade. IT WAS INTENTIONAL ACTS BY DCPP.MEDIA VALIDATE SUCH FACTS,THEN AIR-SUCH STORY in the news for years." IT WAS KNOWINGLY, WILLFUL CONDUCT. A VIOLATION OF THE WORST KIND,SINCE IT INVOLV a loving focus doting attention loving paren to her seven year old and her 10 year old little girl. INSPIRATION FOR ALL WHO ARE STILL SUFFERING FROM WHAT OUR STAFF CALL S.I.T.S. "stuck-in the system." They had a "great life." education at age 7 and 10,in a home without any drug use ever. Until 4th of july weekend, early 2000s...(03-04)WHEN CPS unbeknownst to suburban GOOD parent,felt it was "her and his duty"to legally abduct 2 lil girls during a 'routine court-order'visit to grandma's & the other"parent." INTRODUCING BOTH GIRLS TO AN ABUSIVE LIFE NO CHILD DESERVE." Such caseworker(s)supervisory,et;al. over in Union County,"assume" that accountability would not be visible, regarding the inexcusable & continual day in,day out GRUESOME-TORTURE involving one's loving suburban family. APPROVED BY U.S.DISTRICT FEDERAL COURT. Filed timely pro-se in a timely fashion as warranted. 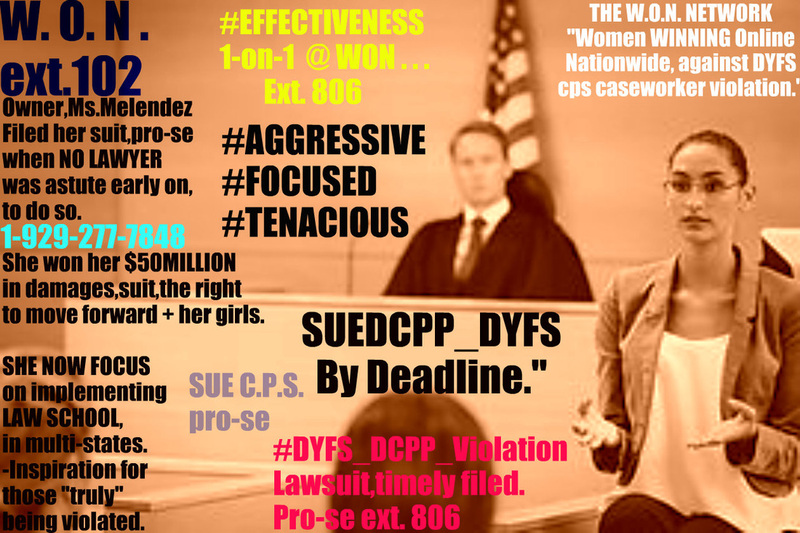 Nation's First Verified Online-Research Ctr.of its kind,when your about to hold caseworker accountable...When suing known as pro per(self file/pro-se)CPS. ​ Immediately speak to your lawyer,call many and not just one... Reach out to your lawyer,and or a lawyer who has prowess in this field of suing cps,by deadline.1 or 2 might just care enough to represent you,if not,at least you know you have tried all you can,within time allotted by law,and are at least still able learn YOURSELF,as we have,how to sue child protection worker,through method of self-file. .
You have the power within you,and intelligence when your dealing with CPS. Many have before you. #YouAreCAPABLE to sue per defendant/dyfs/dcpp violating your rights, harming injuring you, and your child or as case law wholly support, grandchild/grandchildren." Call immediate a lawyer,to represent you,if your ready to sue pro-se(self file)is your right to do so,but you have to keep on calling lawyers,and not just in "1"area,call as many as feasible. Take back your constitutional right,when proceeding to do so..."
after the implementation,of law school. 2. Foster Care Abuse in NEW JERSEY Whereas;CHILD if returned,or never remove would have NOT been so brutally RAPED,SEXUALLY ABUSE,MOLESTATION,HOSPITAL,E.R. Verbal,to Emotional Abuse;and or MEDICATED WITH DANGEROUS PSYCHO-TROPIC;MEDICATION APPROVE BY CASEWORKER;@ DYFS. After DCP&P, (dyfs) union county caseworker and supervisors at NJ DYFS deem such loving parent,grandparent home appropriate.
" Such as Carlos Novoa,or GLORIA CAMERON AKA GLORIA WALTON,SEBASTIAN ANTONY,CASEWORKER WHO "KNEW"ALL ALONG CHILD WAS AT STAID RISK(serious)but yet hinder all truthful condition of the child in order to feign status-quota;status quo, even though caseworker,SUPERVISOR KNEW ALL ALONG,CHILD WAS AT RISK"only AFTER removal from parent." FALSE-Information to a judge adjudicating for which is clearly a unlawful act(s)by caseworker,who knowingly adage,"Child is fine"but yet knew was seriously harmed. FALSE EVIDENCE-including but not limited to a. )Medical Documentation making it"appear"under oath serious injuries,words like"trauma"added,but yet child skin had no bruises; nor a bruising mark consistent with a actual weapon used,or object. When a New Jersey Judge ignore in state court the clearly-obvious in addition to allowing a D.A.G. (deputy-attorney general)representing a falsehood;falsified report(s)and manufactured evidence,provided by "a more than happy"to do-so caseworker for Division Youth Family caseworker DYFS...."It is time to say Enough." you are passed your deadline to sue. ​Such fact(s)on this page happen multiple times to the family of the founder S.Melendez ext. 102/260. Inspiration to many whose been sadly harmed as her family has been by a agency who is suppose to "care" about and want, what is in the"BEST INTEREST" of the child. Clearly....this is not the case as experts agree with what happen to a good loving family,now winning the right to move forward for her damage(s)as her girls,after a long and arduous,painful case for which experts agree,"should have never even made it to the front door of superior court." Where a judge, ON THE RECORD, verified, cites the "worse"case in his ENTIRE family judiciary/superior court files and his time on the bench." NO JURY, as expert cite,reading that,and learning of such fact(s)overall would at all disagree. 1-929-277-7848. SOCIAL MEDIA-A NATIONWIDE VERIFIED 1ST of its kind ACTION Ctr.